DATEDIF returns the difference between two date values, based on the interval specified. Here Interval could be one of Y, M, D or YM, YD, MD. Y gives the number of complete years between two dates. D gives the number of days between two dates. YM gives the difference between the months here days and years are ignored. YD gives the difference between the days and years and dates are ignored. Whereas MD gives the difference between the days and months and years are ignored. Calculate Quarterly totals from monthly data! 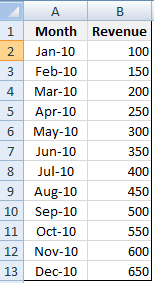 You have Months Jan to Dec in Column A & against the same in column B you have Revenue figure, now lets see how we can calculate Quarterly total of revenue using sumproduct. wherein DefinedName is your name for which data to be copied..
a1 is destination cell in sheet2.